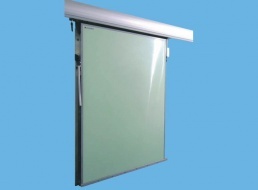 Insulated sliding doors for cold stores at temperatures above zero. Polyester facing. • Food grade polyester facing, colour white RAL 9010 (1). (please stipulate at time of order)(2). • Injected polyurethane core (3). • Pultruded polyester frame + inner frame (4-5). • Frame assembly by counter-drilling the partition and threaded studs (7). • Single FERMOD rubber joint n° 8511 on 3 sides (8). • Single FERMOD lower sealing strip n°3350 (9). • FERMOD stainless steel sliding rail n°7530 providing a seal by pressing the joint against the frame (10). • Rail support strip made of anodised aluminium. Aluminium counter-plate. Fixed in place by counter-drilling the partition and inserting threaded studs. • 304 grade stainless steel frame, C profile, with Styrofoam filling, in 3 parts, without sill. - 304 grade stainless steel facing 0.6 mm thick. - Food grade polyester facing 2 mm thick. Standard RAL colours: White RAL 9010 - Red RAL 3000 - Blue RAL 5012 - Yellow RAL 1018 - Green RAL 6019. - FERMOD n°57 lock with European cylinder and interior emergency release system. - FERMOD n° 58 lock for automatic kit. - JPM standard security cylinder for master key chart (European profile). - JPM high-security cylinder for master key chart (European profile). - Tubular stainless steel protection. - Passage for handling rail. - Base protection: 304 grade stainless steel sheet, 0.8 mm thick, height 1,000 mm. please stipulate at time of order). - 2 remote electric pull switches. - 1 interior circuit breaker. - 1 exterior circuit breaker (palm button).